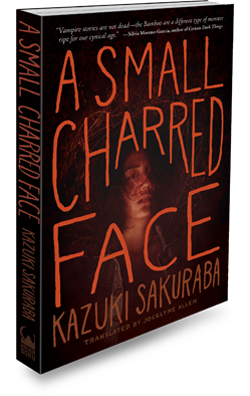 ﻿ A Small Charred Face « Haikasoru: Space Opera. Dark Fantasy. Hard Science. A boy name Kyo is saved from the precipice of death by Bamboo, a vampire born of the tall grasses. They start an enjoyable yet strange shared life together, Kyo and the gentle Bamboo. But for Bamboo, communication with a human being is the greatest sin. It’s the A SMALL CHARRED FACE giveaway contest! The fog’s thick tonight. A good night for hunting! That gust pushed the fog away, and the moonlight from above threw me into sharp relief on top of the telephone pole—a girl standing on one leg, a scarecrow. I winked and waved saucily with my right hand at the girl below. I didn’t have a left arm, so the sleeve of my coat fluttered emptily. When her eyes found me, Momo—“peach”—nodded with what looked like relief. Her lips moved. Ma. Ri. Ka. I’m jumping! The wind roared in my ears. Sudden drop! Night bird style! I had been living for more than a hundred years as a Bamboo, so I was used to this by now. “…Having lived this long, I think human beings…life is a series of choices…I don’t regret anything…But…sometimes, well.” The man was speaking passionately about something. “Yeah. I thought I was fine with that. But now, that choice is really getting its revenge. Which is why I’m doing this with a young girl like you,” he said, turning back toward Momo. And then, in the blink of an eye, a third head between their two. He finally noticed my presence and took a sharp breath. Whatever else I might be, I’m Bamboo, so I offered up a creepy smile, very aware of my monstrous appearance. The man stared at me, long and hard. He then looked at Momo, comparing my face with her suddenly demure look. “Ha?” He let out a shallow breath. …screams like that, so I’m fairly certain I’m pretty frightening now. Although Momo seemed fine with the way I looked. Maybe she was just used to it, though. The man pitched forward, almost falling in his attempt at escape. I watched him go, still hovering about twenty centimeters off the ground. I mean, this kind of thrill’s the whole point of the hunt! Beside me, Momo yawned very deliberately as if to make that point. I guess it was already time for her to go to bed. That yawn was basically like she was telling me not to have fun with this, to just hurry up. So I’d better get to it then. The man looked even more surprised, almost like a small child, an innocent. His face said he couldn’t believe this was happening to him. He hadn’t done anything wrong. He believed that nothing bad could ever happen to him. I sprang up and perched like a bird on his solid shoulder. I chopped my heel into the back of his neck, bringing it down like a judge’s gavel. The man crumpled to the ground with a thud. Momo approached sluggishly, took the man’s wrist, stuck the needle in, almost bored with the familiarity of the act, and drew out the arterial blood. The syringe comically large, like our bodies had gotten smaller. “Yes. Naturally, we’ll also be accepting your wallet,” Momo said, calmly. She was so collected, a doctor in the making.